FIFTH ANGEL recently put the finishing touches on its first new album in almost 30 years, “The Third Secret”, which will be released on October 26 through Nuclear Blast Records. But before their fans can put their hands on the new record, there’s more news to announce from the FIFTH ANGEL camp. Guitarist Ed Archer, who has already been a part of the band in the past (1983–1989, 2010, 2017), rejoins the group as a permanent member and completes the quartet. “The Third Secret” features the incredible talents of guitarist and lead vocalist Kendall Bechtel, bassist John Macko and drummer and backing vocalist Ken Mary. 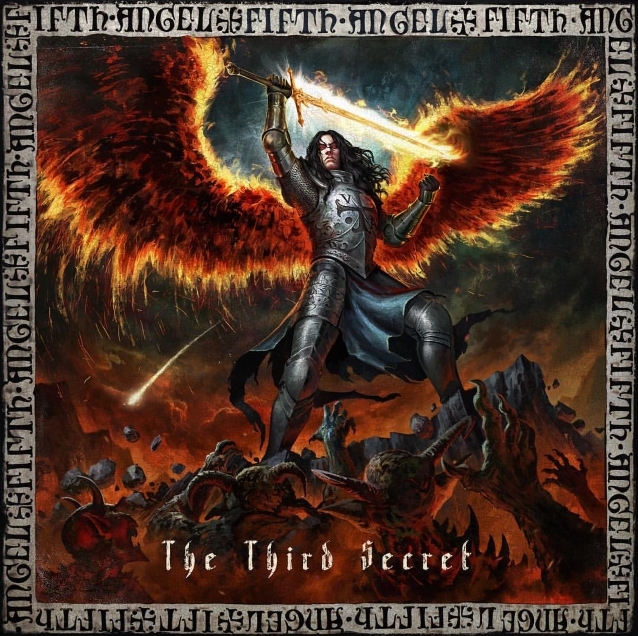 The cover artwork for “The Third Secret” was created by Zsofia Dankova (POWERWOLF) and can be seen below. FIFTH ANGEL will release the new digital single and lyric video for “Can You Hear Me” on September 7. The Seattle music scene in the mid 1980s was a breeding ground of exceptional talent. Heavy metal was a new wave of music that was beginning to sweep the globe, and FIFTH ANGEL was one of the forefathers of the legendary Seattle music scene that also produced iconic bands such as QUEENSRŸCHE and METAL CHURCH. In 1984, high school friends Ted Pilot (vocalist) and Ed Archer (guitarist) teamed up with lead guitarist James Byrd. They filled out the lineup with drummer Ken Mary (ALICE COOPER, HOUSE OF LORDS) and bassist John Macko. Inspired by the success of QUEENSRŸCHE, who shunned playing clubs for the sake of writing, recording and releasing their own music independently, FIFTH ANGEL followed a similar path. Concentrating on honing their writing and recording skills, FIFTH ANGEL crafted the incredible debut album, “Fifth Angel”. This recording was initially an independent release funded and produced by the band, and co-produced by the famed Terry Date. “Fifth Angel” was Date‘s first-ever production, and Date later went on to produce platinum artists such as PANTERA, SOUNDGARDEN, WHITE ZOMBIE and DEFTONES. The album was first released in Europe through a fledgling label named Roadrunner Records based in the Netherlands and instantly became a cult classic in the European metal community. Epic Records in New York City caught wind of the band and were so impressed with “Fifth Angel”, they signed the band to a seven-album deal. Remastering the original independent recording and re-releasing the album, Epic introduced FIFTH ANGEL on to the worldwide stage in 1988. The band received rave reviews and was touted in the press as the “next big thing” in all the major metal magazines of the day, including Hit Parader, Kerrang!, RIP, Metal Edge, Metal Forces and many others. Kerrang! went as far as attaching a flexi disc of the band’s music onto their cover and giving the center fold-out of the magazine to the band. During this same time period, Ken Mary was covering the drumming duties with Rock And Roll Hall Of Fame artist Alice Cooper on the “Constrictor” and “Raise Your Fist and Yell” tours. While on these world tours with Alice, Ken promoted FIFTH ANGEL in both press and radio interviews, which gave some additional momentum to the release. In 2010, some 22 years after the Epic release of “Fifth Angel”, the band was asked to headline the Keep It True festival in Lauda-Koenigshofen, Germany. Gathering many of the core members and adding HEIR APPARENT vocalist Peter Orullian (Ted Pilot is now an endodontist practicing in Seattle and was not able to sing for the reunion), the band prepared a blistering set of songs from the first two albums. The reception was incredible, with the sold-out crowd singing the lyrics to every song. FIFTH ANGEL again headlined the sold out 2017 Keep It True festival as well and this positive momentum planted the seeds for a new album. Jaap Wagemaker from Nuclear Blast Records, one of the most successful metal labels of all time, listened to a couple of demos Kendall Bechtel had been working on and expressed interest in hearing more. A few of the members began writing and recording together and the collective enthusiasm was very strong over the music that was being created. Nuclear Blast signed the band to a new record contract based on a three-song demo that was submitted.